Address: 416 S. Superior St.
My parents both worked for Noble Moore who owned MOORES MUSIC STORE. They would take my two older sisters and my older brother into Albion on Saturdays and we would go to the theater while they both worked. I enjoyed many a western film at that theater. 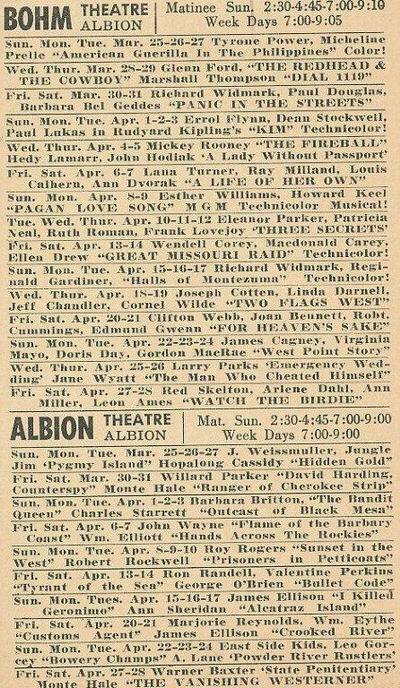 May 1959 - Albert O. Bohm is dismantling the Albion Theatre at Albion but is retaining the Bohm. Morning Star, January 16, 2000, pg. 6 Want to make sure that Albion gets counted correctly in the upcoming U. S. Census this April? (Our 1990 count was 10,066) Become a Census enumerator! Take the half-hour Census job test at the Albion Public Library on Tuesday, January 18, at 2 p. m.
or at the Clarence township Hall on Saturday January 22 at 9:30 a. m. Tell ‘em Frank sent you. Call 1-888-325-7733 for further information. Let’s have locally paid workers conduct the Census count here in Albion! [Note: Mr. Passic was Assistant Manager of Recruiting in charge of recruiting for a 7-county area for U. S. Census 2000] We all know that the Bohm Theater is a major downtown Albion landmark. Albion once had several theaters, however, in the early 20th century, and one of them lasted until 1959. The Albion Theatre opened in March, 1938 in the Thompson building at 416 S. Superior St. This is the building which presently houses the Albion Chamber of Commerce and John Sharp Realty. The brick edifice had originally been constructed as a livery, and a large center arch one contained a ramp upon which horse and buggies rode. The Albion Theatre was first owned by the Interstate Theatre Corporation and was managed by O. J. Lambionette. It seated 500 persons. The first movie shown here was Boys of the Streets starring Jackie Cooper and Maureen O’Conner. Through some clever maneuvering, the owner of the Bohm Theatre, George Bohm, was able to acquire the Albion Theatre in 1939 only a year after it opened. He then operated it concurrently the Bohm Theatre. After George’s death in 1951, the operation of the theatres passed to his brother Albert and then to his nephews Jack and George Ryser. The Rysers opened the Albion Drive-In Theatre in the early 1950s, and would close the Albion Theatre during the summer months when the Drive-In was in operation. A decline in business led the Rysers to close the Albion Theatre in the spring of 1959 the victim of increasingly popular television, they stated in a 1976 interview. From our Historical Notebook this week we present a 1950s era photograph of the Albion Theatre. Next to it on the right is the Vandenberg Photographic Studios, later the site of Austin Studios. How many persons remember the Albion Theatre? Photographs from this section of downtown Albion are hard to come by, and this is the first photograph of the Albion Theatre I have ever seen. I hope our readers enjoy it.